Today’s post reacts to the news that broke this evening concerning the massive accountancy (and advisory) firm KPMG’s withdrawal from the inquiry into the Grenfell Tower fire that occurred last June. Whilst this post will not discuss the Grenfell Tower disaster in any great detail – mostly because it is an extremely emotive subject but also because the Inquiry still has some way to go before concluding – it is worthwhile looking at two specific instances: the most important is to look at why KPMG today released a statement that it had ‘mutually agreed with the inquiry that we will step down from our role with immediate effect’, but it is also worth asking why KPMG was considered an appropriate source of advice in the first place – does the firm’s track record, particularly in the modern era, reveal for us the processes underpinning this most important of inquiries? KPMG is one constituent part of the so-called ‘Big Four’ – the oligopolistic partners within the accounting industry – and its history is a long and storied one. Consisting of a merger between four different firms (with the oldest dating back to 1870 with William Barclay Peat and Co) that took place in 1987, the firm has catapulted itself to a position of genuine influence within the modern economy. However, that propulsion has with it a number of associated instances, with a number standing out. Using the turn of the century as a good starting point in relation to the behaviour within the accounting industry, KPMG’s transgressions, arguably, went under the radar whilst its then-competitor Arthur Andersen was publically decimated for its role in the Enron Scandal; whilst the fall of Arthur Andersen is oft cited, KMPG’s ‘deferred prosecution agreement’ with the U.S. Department of Justice (DoJ) for $456 million (plus $225 million in private settlements) is rarely mentioned, as is the sentences handed to a number of senior KMPG officials for their role in the providing of ‘tax shelters’ which allowed the wealthy to avoid paying billions in tax contributions. That particular era was to be followed with another phase in which the accounting industry (particularly the ‘Big Four’ would transgress en masse whilst other financial service providers would be publically shamed; the Financial Crisis. Whilst big banks, credit rating agencies, mortgage providers and insurers would correctly see themselves publically identified and vilified for their roles in one of the largest instances of ‘wealth extraction’ to have ever been witnessed, the ‘Big Four’ would see their transgressions, again, go somewhat under the radar. During the lead-up to the Crisis, the large mortgage financiers and big banks did indeed partake in what was nothing other than systemic fraud, and credit rating agencies negligently provided their assurances to the overly-risky products that were at the centre of the impending crisis (and the insurance industry allowed for secondary markets and so on and so on), but a fact that was not given the right amount of attention was that for all of these financial juggernauts the requirement to have their balance sheets checked by independent and thorough third-parties remained – and this is where the accounting firms’ transgressions play their part, although the lack of ‘coverage’ would have one thinking differently if one did not appreciate the ‘culture’ within the largest financial firms. More recently, we looked at the continuing fines being handed to the ‘Big Four’, with KPMG being fined recently by the U.S. Securities and Exchange Commission (SEC) for mis-advising consumers in the favour of big business, which is a common theme within industries that offer advisory services for a high price (even the briefest of analyses of the Big Four’s financial statements reveal that advisory services make up a significant proportion of their income, and with that comes unique pressures that affect the role and purpose of an auditor). There have been a number of other instances along the way and there will undoubtedly be many more, but on the back of this admittedly brief review of just some of the industry’s transgressions, we will now review the details of the firm’s connection to the Grenfell Tower Inquiry. The particular details of the case are currently being played out across the media, so for our purposes it will probably be best to be as simple as possible. Officially, the story goes that KPMG were appointed to advise on the structuring of a project management office for the Inquiry, with KPMG declaring that ‘our role was purely operational and advised on project management best practice and had no role advising on the substance of the inquiry’. However, a concerted campaign was initiated in response to the reality that there were likely a number of conflicts of interests present within the relationship; the campaign culminated in an ‘open letter’ being sent to the Prime Ministers from campaigners, academics, and MPs declaring their belief that KPMG was too conflicted to provide independent advice to the Inquiry, and the details of the campaigners’ claim deserve to be looked at. Most glaringly, the auditor that was hired to provide assistance to the Inquiry is, inexplicably, the same firm that audits the parent company of Celotex, the firm that produced the insulation for Grenfell Tower which has, to this point at least, been identified as a key component in the disaster, as well as auditing the Royal Borough of Kensington and Chelsea and Rydon Group, the firm contracted to refurbish the Tower. This intertwining of the auditor in the business of three entities that had a massive role in the disaster should have prevented the firm even being considered for the role of advisor to the Inquiry, but is this the case in reality? MPs and Campaigners have greeted KPMG’s decision to withdraw from the arrangement with a small amount of pleasure (relatively speaking), but have been quick to note that the inference of this sequence of events is a negative one; one campaigner noted that ‘this appointment was yet another example of the government’s deafness to local needs’, which is absolutely correct. However, here in Financial Regulation Matters we are consistently looking to analyse the inference as well as what is stated and, rather unfortunately, this chain of events can be seen to illustrate something which is particularly tragic, but illuminative of the society we currently inhabit. Yes the Inquiry is extremely important, but the reality of the situation, when articulated, makes for tragic reading. The first instance to note was the Government’s, and particularly Theresa May’s, absolutely abysmal handling of the aftermath of the disaster, which came complete with a number of broken promises like the fitting of sprinkler systems to similar residences (something which the Prime Minister would later say could not be afforded). However, even more devastatingly, at the time of writing residents of Grenfell Tower have still not been rehomed, which has led to a string of criticism but still very little action from the Government; David Lammy MP, one of the most vocal critics of the Government’s handling of the disaster, is clear in his understanding that there is a chasm between the citizen and their representatives in this, and many other circumstances; perhaps, as Lammy notes, that may indeed be at the core of the problem. Theresa May was asked in the House of Commons how safe she would feel living on the 20th floor of a large Tower Block with no sprinkler system and erroneous safety advice (and inadequate cladding and insulation and so on and so on) and the simple answer to that poignant question is that she simply will never experience that scenario – so, how representative can she really be? What she, and the Government moreover do understand however is business, and the protection of big business to be precise. Yet, it is too easy to suggest that KPMG was allowed to advise the Inquiry because of its ashamedly pro-business culture, because in reality what we are witnessing in this scenario is just the latest in a long line of division that underpins most of modern society (particularly in the U.K.) – the people who tragically perished in Grenfell Tower were, by and large, poor people, and overlooking that fact is, and always will be a tremendous error. 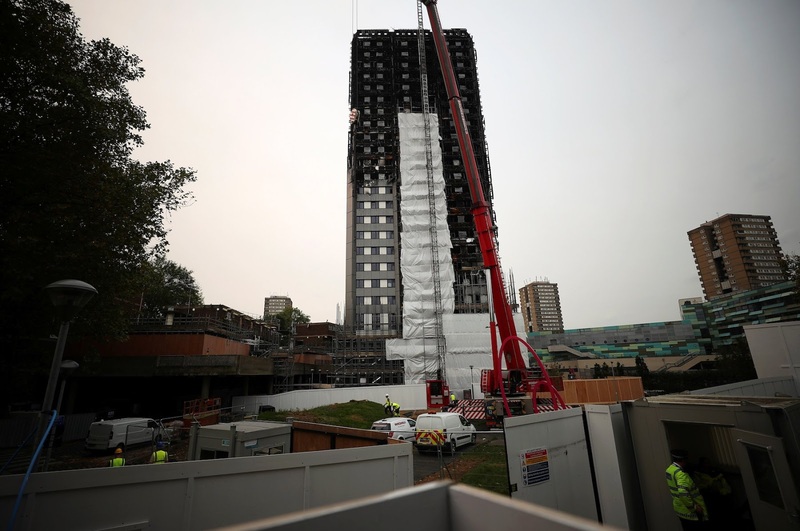 The cladding that was attached to the building, the cladding which allowed for the fire to spread at an alarming and debilitating rate, was erected to mask the aesthetics for those who owned homes in the much richer parts of that particular borough. The companies which were contracted to carry out significant and important work on the building are owned by wealthy individuals. Now, the Inquiry that has been set up to, seemingly, provide answers to the public as to the events that led to that horrific sight of a large building being gutted by fire with its occupants trapped, is being advised by a company that all the other companies pay for services on a number of other occasions. It is easy to dismiss this connection as being demonstrative of a larger and more brutal reality, but it is vital that we seek to assess situations within this particular paradigm; if the scenario does not fit the paradigm then that is great, but the incredible amount of times that it is does presents an awful reality in which the poor are being consistently abused, and without any conceivable recourse. The actions of the campaigners who highlighted these conflicts and brought about KMPG’s withdrawal is just one heroic action in a long list of heroic actions that have followed the disaster as many attempt to seek justice for those who were tragically killed last year – that they have to do so much to get justice is, perhaps, illustrative of the real problem we face.